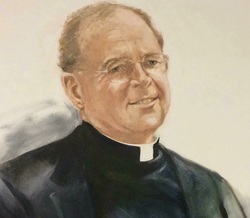 In the mid-90’s, as pastor of Immaculate Conception Jesuit Church in the Central Business District of New Orleans, the late Father Harry Tompson, S.J., saw firsthand the effects of deep poverty on the New Orleans community and how that poverty held back not only individual lives but also the potential and growth of our city as a whole. Fr. Tompson knew that without love, opportunity, and the challenge to reach their potential, children living in New Orleans in poverty were destined to fall victims of their own communities and remain in the desperate cycle of poverty that had often gripped their families for generations. He knew the only way to truly address poverty was at its roots by providing our poorest children with the best education possible, and he knew that Nativity schools in other cities across the country were doing this with considerable success. With the determination and vision of Fr. Tompson and the overwhelming support of those who agreed that an intensive education was the best thing to give an at-risk child in New Orleans, The Good Shepherd School opened its doors to thirty children in the fall of 2001 and began to provide them with a unique educational opportunity firmly rooted in the Nativity model of education. Year-round school: GSS far exceeds the mandated state time for instruction with a school calendar that includes a mandatory summer session. Extended-day: Good Shepherd opens at 7:15 a.m. for student breakfast and school is not dismissed until 5:00 p.m. with students participating in an hour-long enrichment period which includes creative activities, art, dance, music, athletics, technology, and academic-related sessions. Small class sizes: GSS strives to keep classes small with teachers, subject interventionists, teacher assistants, social workers, volunteers, and mentors available to work with students to meet their individual needs. Tuition paid by benefactors: Parents and guardians of The Good Shepherd School students only pay $125 per year and are required to be involved through a parent time investment requirement and attendance at various GSS community events. The $14,500 current projected annual cost to educate each student is funded through our fundraising programs and the generosity of our benefactors. Good Shepherd is dedicated to enabling our students to eventually break the cycle of economic insecurity into which they were born and realize their fullest potential as productive members of society. We anticipate significant changes in the lives of our students, including our expectation that all of our graduates will enroll in quality area high schools. GSS graduates are currently performing extremely well at many area Catholic schools and high-performing charter schools. We are determined to stay involved in the academic careers of our graduates so that when a child graduates from Good Shepherd, he or she will continue to succeed and grow – and eventually graduate from not only high school but also college (a first for many in their families). We ensure this continuity of expectation for these students with our Graduate Support Program , in which we monitor the post-Good Shepherd scholastic careers of our graduates and provide them with the academic and social support that they need to continue to succeed. Because of the kindness and compassion of our benefactors, we have been able to continue our important work since 2001 and as we reflect on our accomplishments and the lives we have impacted, the need for Good Shepherd in our community is still great. Dropouts who become involved with drugs and crime cost our country an estimated $2,000,000 each. Nearly 20% of our students are from families in which an adult has been incarcerated. As the needs of our students remain great, the Board of Directors, faculty and staff of Good Shepherd remain dedicated to providing all children admitted to our school with the comprehensive, excellent, faith-based education that will help them break free from the cycle of poverty and become productive members of our society. On behalf of the Good Shepherd Board, staff, students and their families, thank you for considering partnering with us in giving our students the opportunity to pursue their true potential. We welcome you to visit our campus so you may directly see the wonderful progress of those children entrusted into our care and Father Tompson’s dream in action.